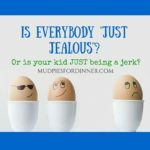 Mud Pies for Dinner ~ Page 6 of 6 ~ I started this blog to embarrass my children. That is my number one goal. If you are entertained in the meantime…great.